....and as Schulz pulled a Serena Gauland only smiled, stayed totally quiet and said: I don't talk at that niveau! I don't talk at that niveau! Which would probably be the biggest joke of the day. Gauland has set new post-war lows for the Reichstag and German politics and he continues to surpass himself. It was nice to see him exposed. The SPD might have fallen grace, but in battling right-wing extremism, they might find back tl their roots. It was nice to see him exposed. How was he exposed? Gauland was just himself...it was the task of the other politicians to be better than that...oh how they failed....Between the Pöbeleien of Kahrs or Schulz, where was the vaunted "countenance" left? The AfD then marched out, heads held high...again the "martyrs", the ones not screaming back! If going down to their level, acting like them means "exposing", dann "Gute Nacht". The SPD might have fallen grace, but in battling right-wing extremism, they might find back tl their roots. Gauland and others have doubtless been emboldened by the Swedish right-wing "victory" margin, as well what's going on now in Hungary. Which thankfully has not happened. Schulze might not have been calm about it, but he did not lower himself to their level. What he actually said had substance and served as a powerful that the modus operandi of the AfD has been seen before in the same building. Can someone provide link for schulz's speech after gauland? That standing ovation were so embarassing to me too...I waited for the rythmic clapping known from the Volkskammer. Sometimes they just go overboard, it's not a pretty picture and so useless in their fight against the AfD...do they really believe they just did their cause a favour with that??? I hate Schulz, not because he's a liberal but because he's an Zionist who says **** like Germany only exists to serve Israel. The exact quote is : "For me, the new Germany exists only in order to ensure the existence of the State of Israel and the Jewish people"
Really? That is news to me...do you have a link? "Yes, there are, for example, young Palestinian men who have been brought up, who have been educated, with a deep-rooted antisemitism." 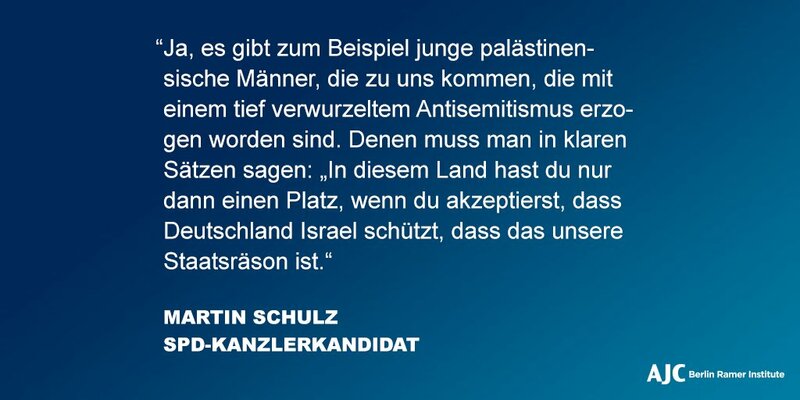 Schulz argued that they need to understand that Germany supports Israel. That is actually a real problem and his position on that is to be supported. They shouldn't be allowed to live here when they want to bring their wars with them...I agree! Certainly Germany doesn't wish to repeat her heinous record of ignoring human rights of the people from whom her ancestors mercilessly robbed them. marginalized and looking after their own nationals at home. Merkel, indeed no German Chancellor, should have to placate right-wing, anti-democratic demagoguery in order to serve the best interests of their people. In pandering to the worst elements of populism, Germany cheapens both herself as well as her place in today's global market. This is nothing new though. Safeguarding Israel's existence has been part of the FRG's reason of state dince its' inception and rightly so. Yet, Merkel as usual is damned if she does and damned if she doesn't! ....imagine this gov coalition breaks down over Maaßen....will she return for a new election? I am more concerned over the fate of the Union than about Merkel. Many people in the CDU are tired of the escapades of the CSU, and if the Bavarians really do sink the coalition to back someone like Maaßen, we might indeed see a split between CDU and CSU. The European Union is in it's early death throes....if it is to survive at all,it needs radical change....they keep pushing for more integration when that is not what people want.They just want economic union,not political union. I am more concerned over the fate of the Union than about Merkel. That split would be a logical consequence though...with a CSU then being downgraded to a regional party, with a CDU following the SPD down in the numbers, with the AfD waiting to fill that vacuum on the right, becoming a strong regional party in the East...that would be the end of the political stability of after-war Germany. unrecognizable to those belonging to our generations, that's all. Sorry if I caused offense! Germany changed so much during the centuries, last time 1989...another change, maybe a regionalizaton inside the EU, could be on the table for the future. Change doesn't have to be bad. On the other hand, if any nation which is basically homogeneous (gleichartig) is forced without its consent to alter the essential cultural make-up with which it has grown accustomed for millenia, this has got to have certain harsh reprecussions (Gegenreaktionen) on the populace. What are you meaning by that? Another drastically change of Germany because of another holocaust and a total destruction and occupation as consequence of another lost war? Not in the way you mean it, but compare the outward look of the German culture in which you grew up! New York, Baltimore and so forth. Not so in Germany, save for the past two decades or so. foreigner, and Hannover ain't a small town either. How the future develops tomorrow will be decided by the youth, not by us. And they are already growing up in a different world than us...for them the change won't be so catastrophic or dramatic or threatening. Tell me that people still don't think those guys are coming to assimilate?